Learn how to publish a library of your code on NPM. Integrate React components into an Express based client. Go to the NPM website and create an account. NOTE: At some point in this process you are going to be asked for a public facing email account. They will tell you explicitly that the email they want you to enter is public facing. When they do that, you might want to go to Yahoo, Google, Microsoft or somewhere and create a trash account that you never intend to use. OPTIONAL: Go to Gravatar and add this trash address to your account so that you can have your picture published. When run, adduser asks you to enter the user name and password that you just set up. The name and version fields are required. For your name, use only small letters. Add something like isit322-lastname, for instance, isit322-calvert. You should, of course, put your name rather than mine in your package. NOTE: The versioning system described here is captured in a standard called semver. It is very widely used and is something that you, as a developer, should understand. As a rule, we only increment a major version number when we publish a breaking change. The minor version number is usually for new features. The patch is when we publish a bug fix. By writing npm version patch, the patch portion of the version number in your package.json file is automatically incremented by one. For instance, 1.2.3 becomes 1.2.4. You can also type npm version minor to increment the minor version number, and so on. Create a method on the client that uses fetch. That method should retrieve the value from the server and display it. You can display the string that is returned in an HTML paragraph tag. Base your work on the App.js component from RestBasics. entry: This is the first, and in our case only, file that contains ES6 that needs to be transpiled. module.loaders.test: Tell WebPack and Babel which file or files need to be processed to create our package. 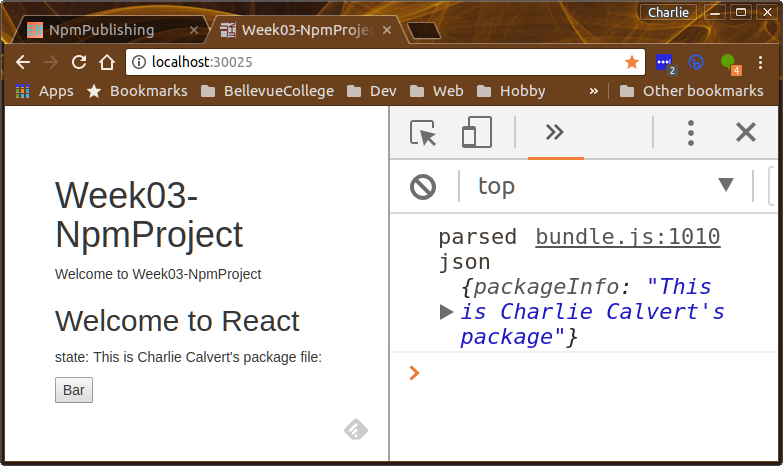 When I run Week03-NpmProject I'm expecting to see output from your package in the browser.